Last week. 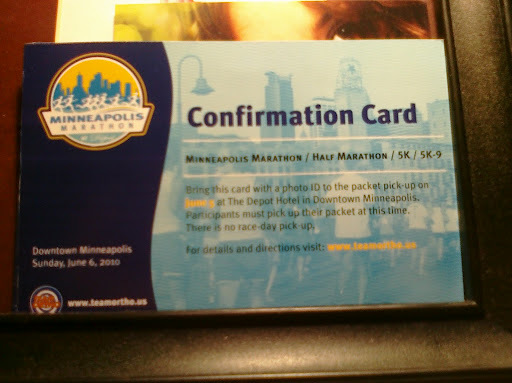 I got my updated CONFIRMATION CARD in the mail for the Half Marathon I’m running in on June 6th. It was awesome. I was so excited at the thought of being a part of Minneapolis Marathon and getting my little medal for completing the race. Last week, I also tweaked my back. Drat!! I think it was from lugging around Mr. Monster Tot, but who really knows. It’s the first time I’ve had any problems since I was pregnant, and I gotta tell you, the whole this is really frustrating. I feel like I just got excited about the race instead of apprehensive about it. But, I’ve decided not to let it get me down too much. I wasn’t trying to finish the race in record time, or anything. I was just trying to finish. So, I’ve been saving my back by walking more than running. But’ I’m still moving, which is the important thing. Speaking of walking, I’m joining the Minnesota AIDS Project for its 23rd Annual Minnesota AIDS Walk to raise funds and awareness in the ongoing struggle against HIV. The walk is this Sunday May 16th and even if you haven’t registered or raised a bunch of money they would still like you to come out to Minnehaha Park and participate. Hope to see you there and keep moving those feet this week. And since, I’ve been in a Middle Eastern cuisine mode lately and since it;s been cold here in the Twin Cities, I thought I would share this delicious soup recipe with you. The blend of spices in it will make your kitchen smell AMAZING. It’s hearty, but still low fat, low carb and low calorie. Previous postI love Lost and I love Muppets. What else do you need? How awesome – a half marathon! I am working up to a 5k right now…that's just a drop in the bucket compared to a 1/2. That soup looks yummy. I think I may have to try it.last but not least…good luck on the AIDS walk. I love walking for a cause! 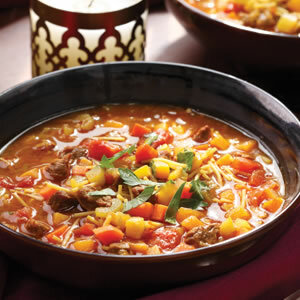 OMG…that soup looks soooo good. You are making me hungry! Did it turn out good?